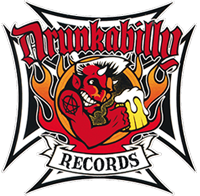 Drunkabilly Records & Mailorder - HOWLIN' BONES : Juice The Goose! 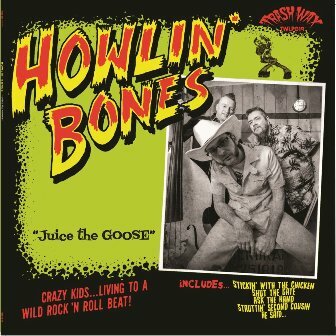 HOWLIN' BONES : Juice The Goose! 400 copies on Black vinyl. This is one great album...Trashy as hell?...Yep, Mixing totally unconventional Rockabilly with some downright dirty trash beats, The Howlin' Bones give you some idea of what lurks in their warped minds....If you think that primitive rockabilly ended in 1956 ?....This ain't for you ! It's a purist's nightmare ! Throw in a bit of Punk, a huge slice of Hasil Adkins (These guys can actually play though !) and you're getting close. Sleeve layout and concept was originally done by Bal (Of The Sting Rays, Earls Of Suave, Ug & The Cavemen notoriety) for the mid 80's Hasil Adkins LP which came out on Big Beat....Now you know why it looks familiar !